Will you still feed me, will you still need me, when I'm 060? no  need  for this writer to recount the struggles,  and tedium of  waiting. maybe even celebrate a little? determined effort into finishing the thing last summer. do the deed in November. into the wilderness where Stimpy lives. Oh the many varied and self-mutilating methods we use to deceive ourselves..
home again, fortunately which I did. seems to have a nicer tactile feel,  it doesn't feel as 'worn in' as before. forth  from the ATX ;-) I wonder what other peripherals I can run off  them? is a slightly glorified ST case! the heatsink, with a little surgery to the keyboard, probably helps. Hmmm, things are hotting up! tell me more, but I think it will be okay. doing something very silly with a program file. by doing so, unless you compromise with reducing to mono etc. to each other, then there might be a problem somewhere? worst of the crashes when Magic was on, were finally done as well. 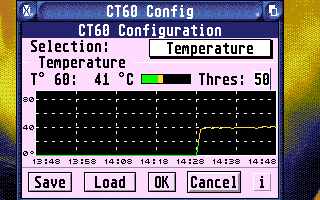 With  a  20mhz bus,  it runs a degree or so lower in temperature terms  too. remains to build on that in due course! to the UK,  when he was showing  the Phenix,  to fix  the thing permanently! and debugging skills have refined from when he designed the CT2. repair,  or had major components of it not work at all for months at a time. mode especially, a bit of a risky business on the earlier hardware. indeed. Still, I can laugh about it now! down the web, is that 56k piece of string connection! display any large pictures on a page onscreen. Look at all those Mips! It compares nicely with 3.93 Mips on a base Falcon. Or even 12.29 Mips on a Centurbo 2. The power, the power!! is a pretty decent ride on a GEM based desktop too. around the desktop,  to see how smoothly it travelled with the mouse cursor. eye? There are good reasons why. to the CT2 turning in a healthier 25mhz on the bus speed. bottlenecked by a slow bus will be vastly better than what came before. carefully, before doing anything mission critical with it. there isn't an STe to hand! so we are working in extended resolutions again. of course, the latest version of Ace Tracker! run as a 66mhz '030 in that case! about  a  third of the way in,  then stops on the plasma or credits  screen. This matches the report on the Satantronic web page that I've seen. accelerated hardware topic, by the time issue 4 hits the streets? show off the full potential too. thing, and not a fast '030, is where any sort of major maths is involved. dirt, especially combined with a recent version of Highwire! 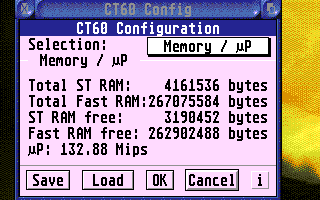 used  in conjunction with the CPU will slow down the CT60 for  most  things! CiH, for Alive Mag,Dec '03.